High performance KB Mopar 340 pistons offer a significant performance improvement for your engine, at a very affordable price. We have these piston sets available in a wide range of sizes including standard bore and many popular oversizes. 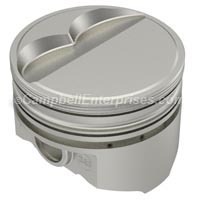 If you are rebuilding a Chrysler, Plymouth, Mopar, Dodge 340 engine and are looking for improved performance, without the higher cost of forged pistons, KB performance pistons are an excellent alternative for many street, muscle car restoration, cruising and mild street / strip applications. NOTES Centered pin. Piston above deck .018. Molnar Technologies H Beam 340 rods are machined from billet 4340 steel, and then heat treated to provide improved strength. To make the rods even stronger, they are shot peened to which also increases fatigue life. All Molnar connecting rods are fitted with highly durable premium bronze bushings for use with floating pin type pistons. Each rod set includes ARP fasteners, moly lubricant and installation guidelines. Eagle Specialty Products SIR connecting rods are an economically priced alternative to the time and expense involved in reworking a set of stock OEM rods. SIR connecting rods are forged from 5140 steel and most are available for both pressed fit pin use, or bushed to work with full floating piston pins. ESP I beam SIR Eagle connecting rods utilize ARP 3/8" Wave Lok bolts and nuts. Eagle SIR rods are economically priced and are often less expensive than having your old stock rods reconditioned.